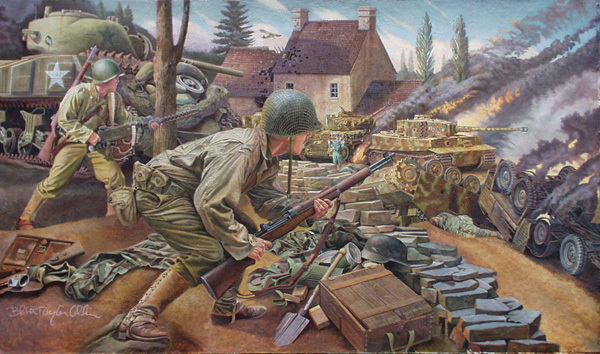 "Closing the Gap" depicts the last dramatic phase of the Battle of Normandy where the German 7th Army was encircled by Allied forces in the Falaise Valley around St. Lambert, Trun and Chambois in France. A framed Limited Edition Print of "Closing the Gap" hangs in the Field Artillery Museum at Ft. Sill, the Infantry School Museum at Ft. Benning, the Medal of Honor Museum in Charleston, S.C.. "Closing the Gap" is in the permanent collection of the Musee du Normandie at Utah Beach. Additionally, the same picture hangs in the City Hall or Hotel de Ville of the French towns of Periers, Le Plessis, St. Germaine sur Seves, Mayenne, St. Suzanne, Chambois, Avril, and Hayange.